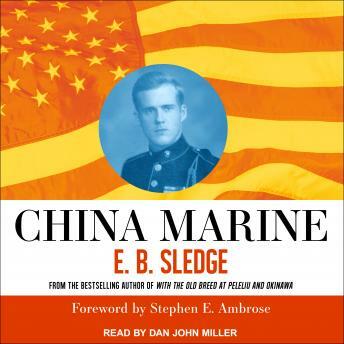 China Marine is the sequel to E. B. Sledge's critically acclaimed memoir, With the Old Breed: At Peleliu and Okinawa. Picking up where his previous memoir leaves off, Sledge, a young marine in the First Division, traces his company's movements and charts his own difficult passage to peace following his horrific experiences in the Pacific. He reflects on his duty in the ancient city of Peiping (now Beijing) and recounts the difficulty of returning to his hometown of Mobile, Alabama, and resuming civilian life haunted by the shadows of close combat. Distinguished historians have praised Sledge's first book as the definitive rifleman's account of World War II, ranking it with the Civil War's Red Badge of Courage and World War I's All Quiet on the Western Front. Although With the Old Breed ends with the surrender of Japan, marines in the Pacific were still faced with the mission of disarming the immense Japanese forces on the Asian mainland and reestablishing order. For infantrymen so long engaged in the savage and surreal world of close combat, there remained the personal tasks of regaining normalcy and dealing with suppressed memories, fears, and guilt.